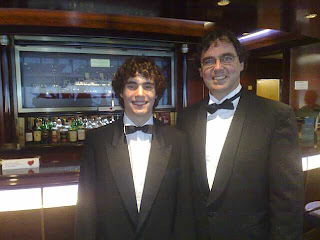 This was Lachlan and my first time in a dinner jacket. We thought it would be nice to have a few pre dinner drinks in the "Crow's Nest" bar high up at the front of the ship with panoramic views. Can you see the amazing model ship behind us?